Voice message left on Dr. Tadros’ answering machine in June 2011 by Jan who worked as Stephen Doyne’s office manager of many years. 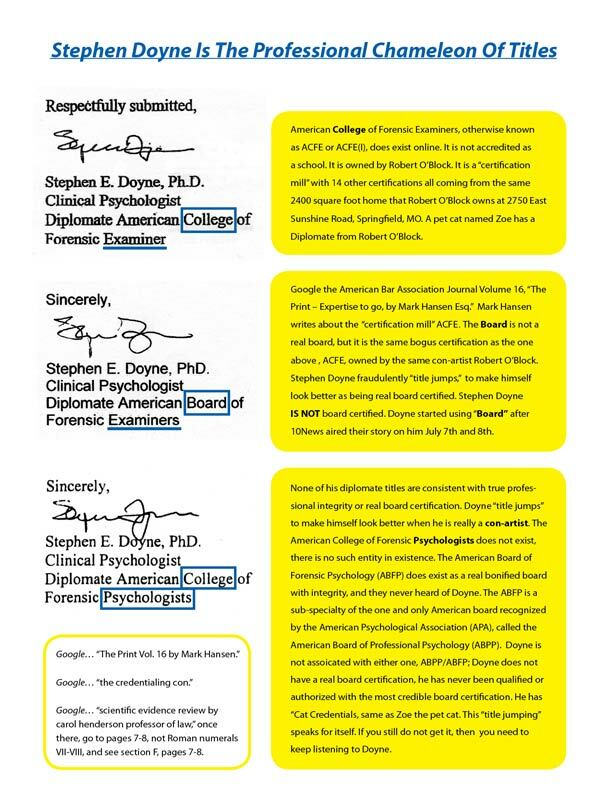 Stephen Doyne does not have a real bonified Board Certification like from the AAFP. 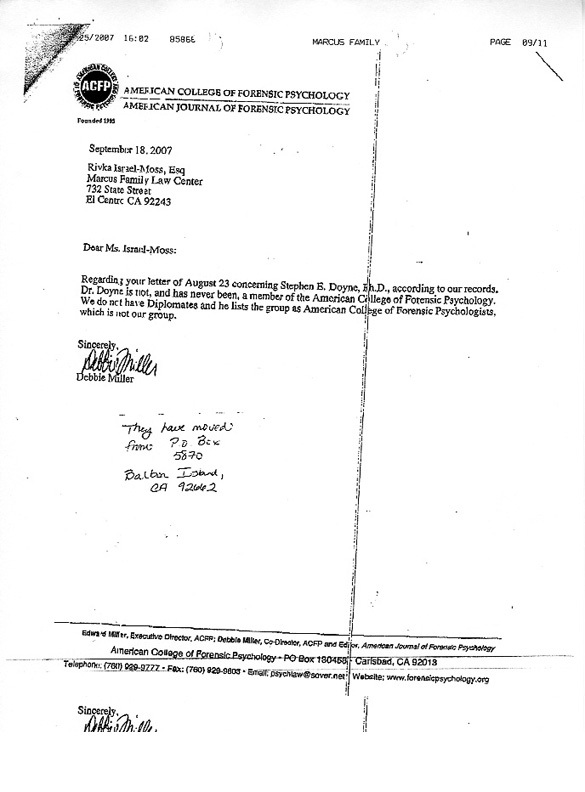 According to the Nationwide well respected Psychology Board Certified: 1- Dr. Eichel, 2- Professor of Law Carol Henderson, 3- Professor of Law James Starrs, 4- Professor of Law Andre Moenssens, 5- Mark Hansen, Attorney and publisher of the ABA, and 6- Elizabeth McDonald of the Wall Street Journal ALL confirm that for $350 dollars, Robert O’Block, who honored a Specialty Diplomate to a house cat named Zoe (which states on the certificate Zoe has a PhD), and who also granted a Specialty Diplomate to Custody Evaluator Stephen Doyne, is threatening to sue the co-founders of California Coalition for Families and Children (CCFC) with a defamation lawsuit seeking penalties of 1,000,000 Dollars. 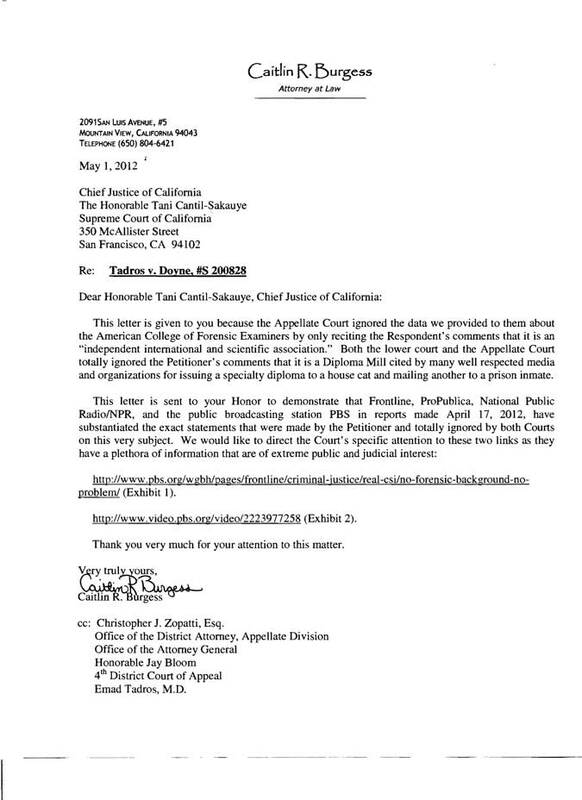 Robert O’Block is seeking to shutdown The Public Court for exposing the truth about the “cat credentialed?” Custody Evaluators – The Public Court. 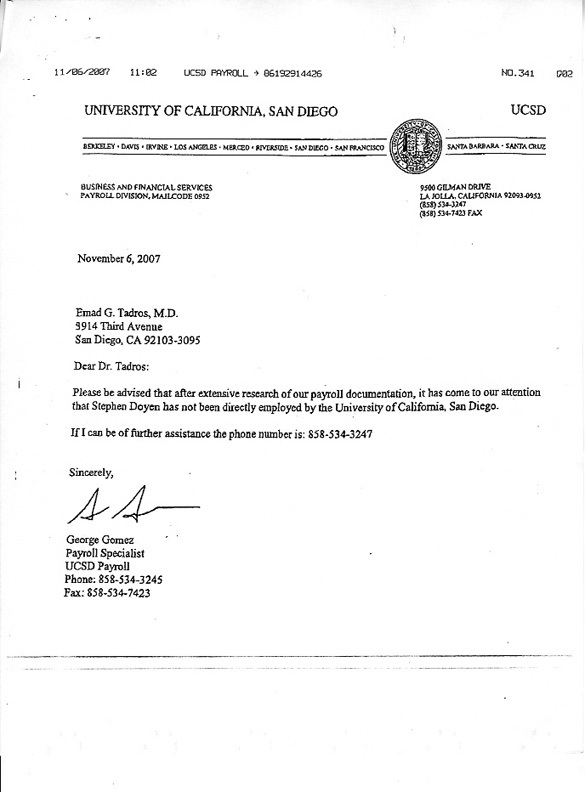 If Dr. Tadros and CCFC do not keep quiet or “shut down” public exposure about Zoe the Cat getting a PhD and Diploma, they will be sued for this huge sum of money? 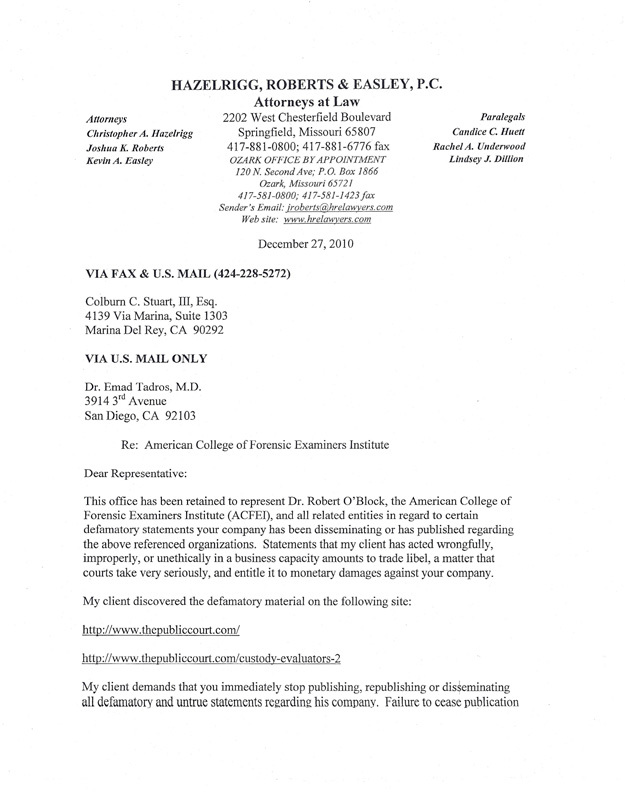 Read the correspondence to ACFEI before Dr. Tadros filed the lawsuit. 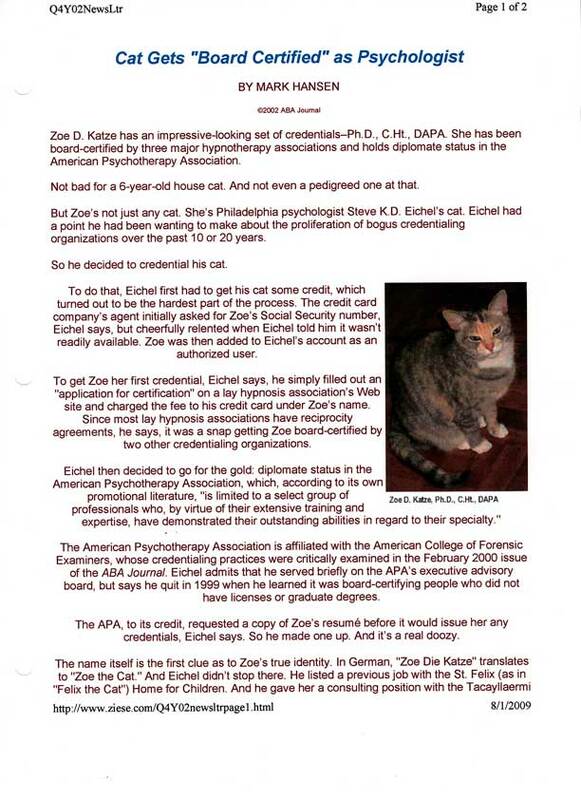 Please note that neither Zoe the pet Cat nor Stephen Doyne have the one and only highly respected Board Certification from the American Board of Professional Psychology (ABPP and ABFP). Copies of Zoe’s and Doyne’s Diplomates are further down the page. Custody Evaluator Stephen Doyne PhD., with a false Diplomate (cat credentials) CONTINUES TO BE the lawyers’ and judges’ Principal Lecturer, nick named the Dean, across the State of California teaching the California Rules of Court. The Rules he personally taught, yet never followed and violated for years! Please read the Amicus. This story is shocking and will shock the nation as to WHO EXACTLY our Custody Evaluators are! 10News Story on Stephen Doyne PhD. aired July 7th and 8th, 2009. 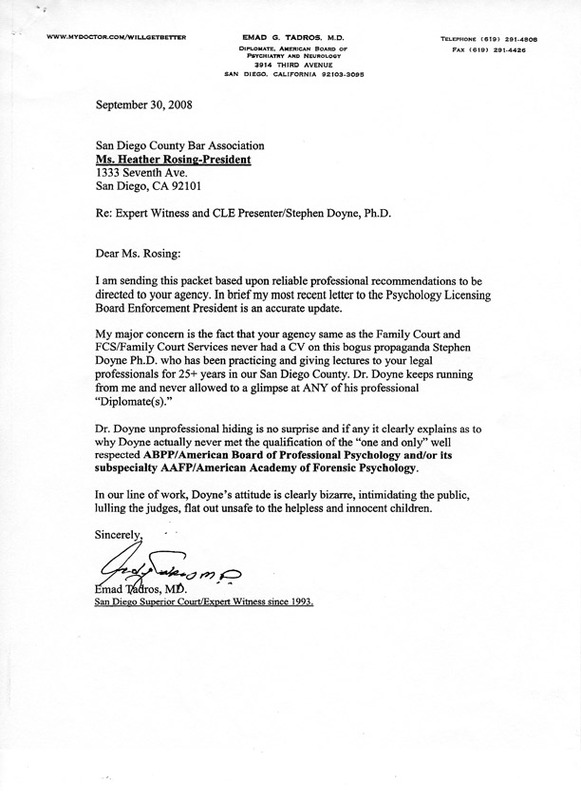 SAN DIEGO — Dr. Stephen Doyne, PhD, is widely used in the San Diego Family Court as a custody evaluator. His job is to advise the court on where children of divorce should live, which parent is more fit. The evaluations can be costly, both in emotion and dollars. Clients told the 10 News I-Team they paid Doyne between $5,000 and $30,000. “A child custody evaluator has tremendous power and influence,” said Marc Angelucci. He’s an attorney representing Dr. Emad Tadros in a civil lawsuit against Dr. Doyne alleging fraud and negligence. Dr. Tadros is Vice Chief of Scripps Behavioral Health Services. 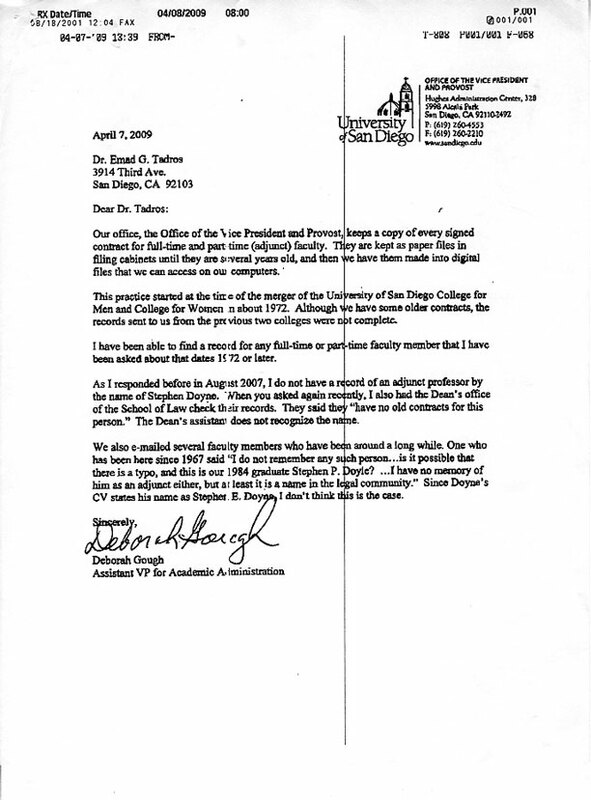 He was a client of Dr. Doyne and felt Doyne’s work was unprofessional. When Tadros researched Doyne’s credentials, he believed they were falsified and dubious. 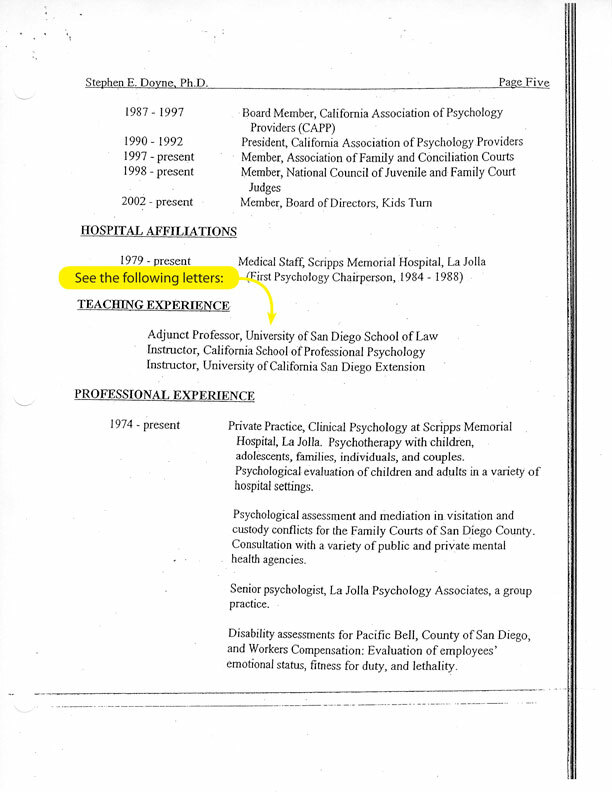 Dr. Doyne’s resume, also filed in court documents, lists Doyne as an Adjunct Professor at the University of San Diego Law School. Maureen Miller, a client of Dr. Doyne, said Doyne made another claim to her. 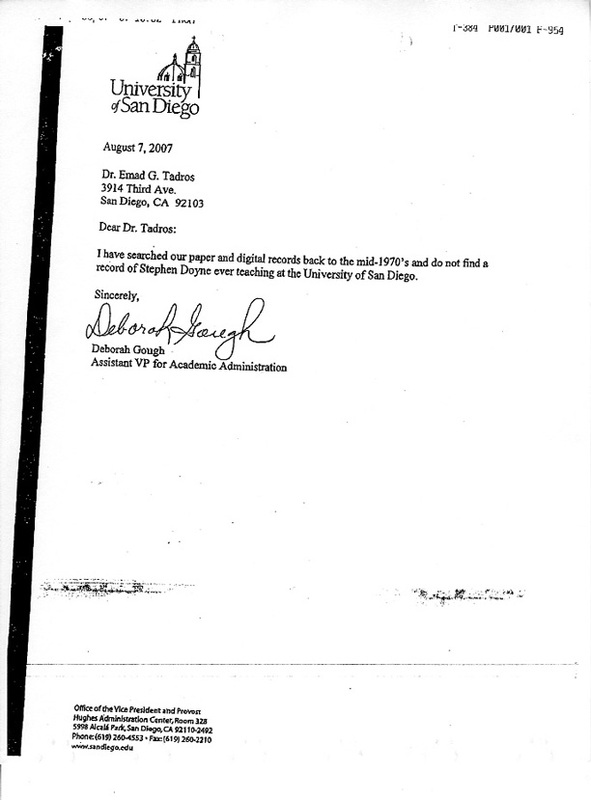 A letter from U.C.S.D., also filed in the court file, says after “extensive research” Stephen Doyne has not been directly employed by the University of California San Diego. 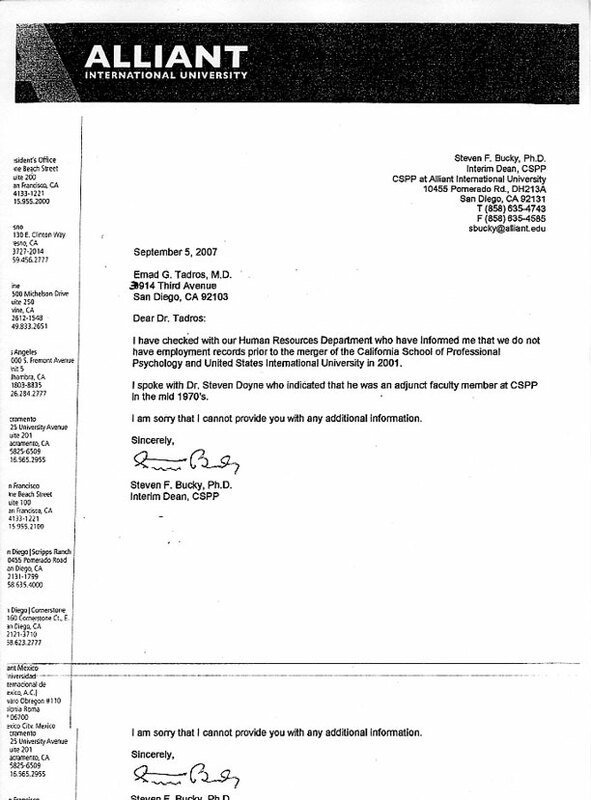 Dr. Doyne is one of a dozen custody evaluators repeatedly used by San Diego Family Court. The court had no response to the allegations against Dr. Doyne. The court also clarified that it does not verify the professional licenses or the resumes of the custody evaluators. 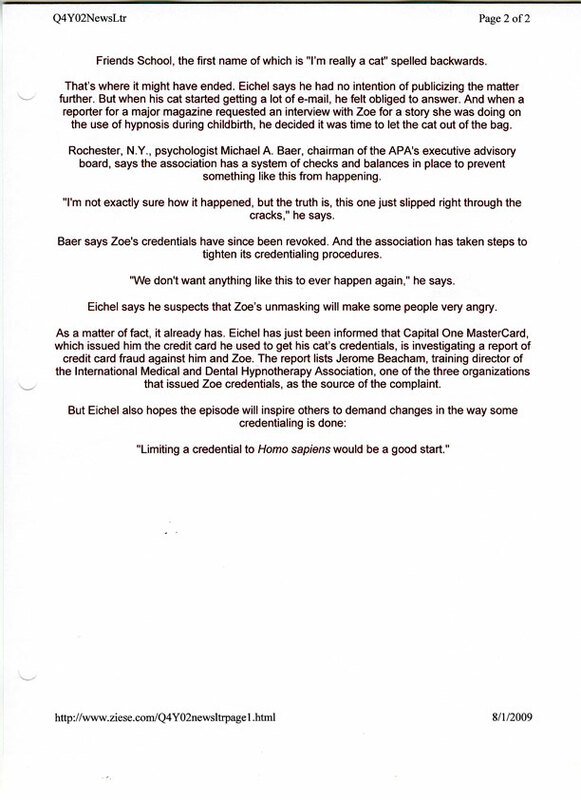 ~End of ABC News I-Team Investigation statement. 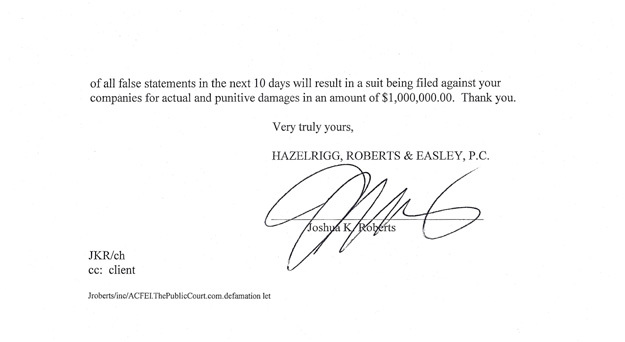 The signatures are actual signatures taken from correspondence from Custody Evaluator Stephen Doyne to his clients. Zoe D. Katze means Zoe the Cat! Keep reading it gets even better and more intriguing! Carol Henderson writes about “cancerous” Diploma Mills, Mark Hansen, Robert O’Block’s ACFE (Doyne’s Diplomate), and Dr. Steven Eichel and his credentialed pet cat Zoe. 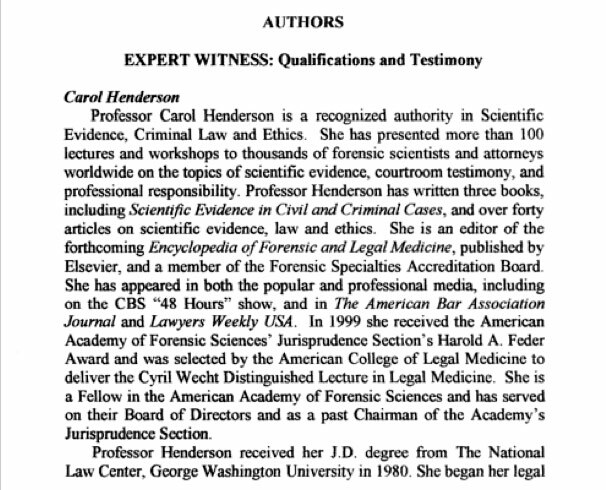 Among her other achievements below, she is a Fellow of and has served as Chairman of the highly respected American Academy of Forensic Sciences AAFS. “He basically takes people’s money and gives them a worthless piece of paper,” says Robert Phillips, an Audubon, N.J., document examiner. “He’s just in it for the money.” Phillips claims he has reason to know. He says he resigned as chair of the organization’s certification committee in 1993 after discovering that O’Block was issuing credentials to unqualified candidates behind the committee’s back. Many of the nation’s leading forensic scientists don’t seem to have much use for O’Block or his organization either. James Starrs, a professor of law and forensic sciences at George Washington University, says the organization’s certification process lacks objectivity. “It’s driven by the felt needs of the people in charge,” he says. “If they want you in, you’re in, even if they have to break all of the rules to do it.” Andre Moenssens, a law school professor at the University of Missouri–Kansas City and an expert on scientific evidence, goes even further. He says O’Block’s organization is basically a certification mill. “For the right amount of money, he will certify just about anybody as an expert in anything,” Moenssens says. 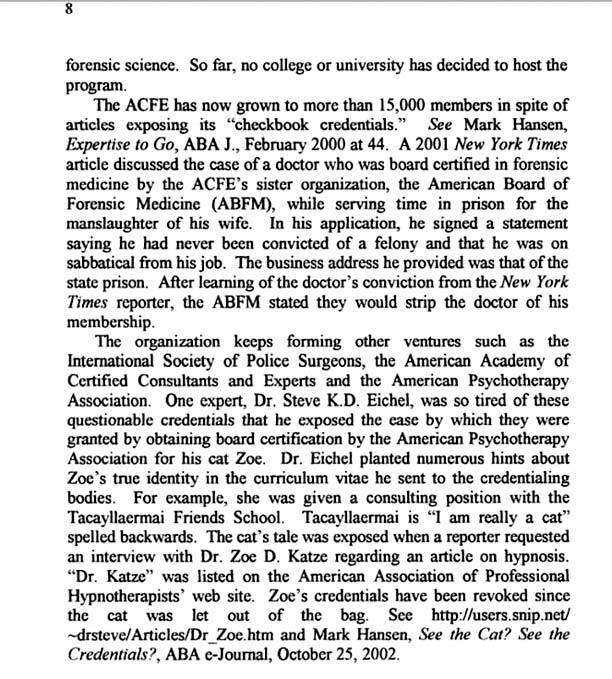 The well respected and well qualified Dr. Steven Eichel, Real Board Certified by the American Board of Professional Psychology/ABPP and owner of the cat or Dr. Zoe De Katze, the cat who honorably received her Specialty Diplomate & PHD Certificate from ACFE states that he had to quit working for the ACFE when he realized that its board certifying people did not have licenses or graduate degrees. 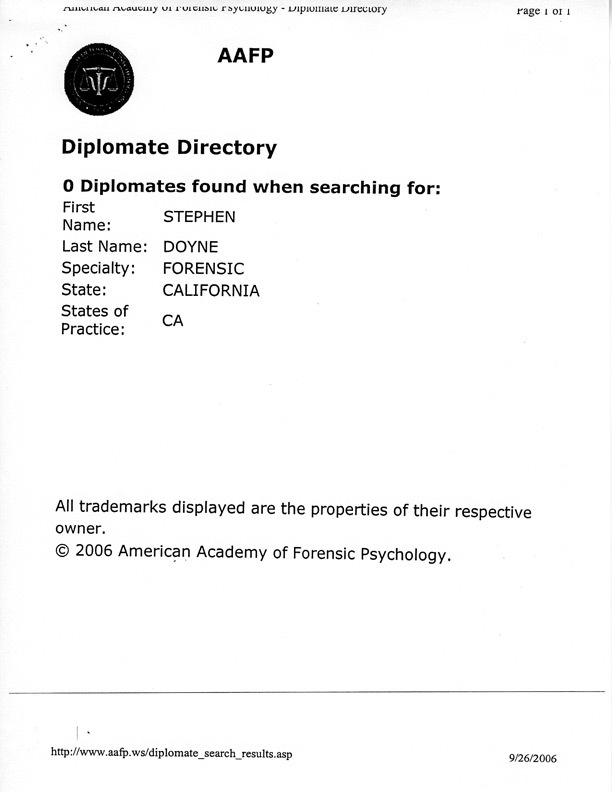 ABC’s 10News I-team investigation (investigating the Bogus Credentials Fraud of Stephen Doyne) and the investigator team of the second bogus Steven Feldman Phd/Saratoga County news release stated that O’Block would not cooperate or return phone calls or any inquiries about Stephen Doyne or Feldman Diplomates that were issued by O’block’s entity. 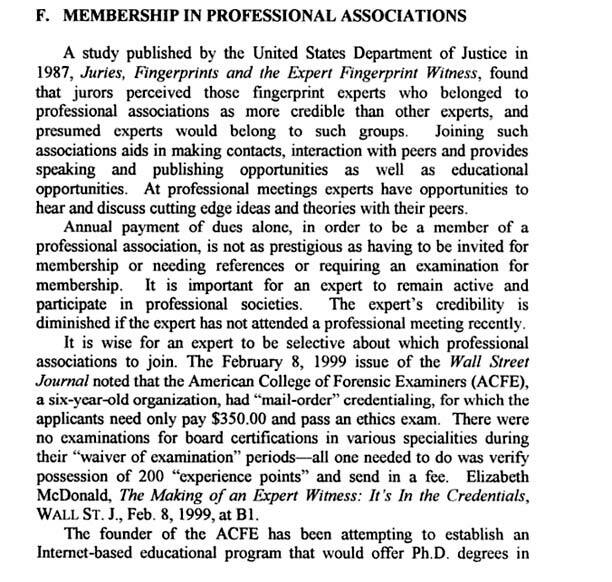 The same goes where Dr. Tadros was never allowed to know anything about the Credential Fraud Con Artist Stephen Doyne. An internet search of the US Department of Education and Distance Education revealed no presence of ACFE at both entities. We the public have the right to know how and whom does O’Block honor such specialty Diplomates to? THIS IS OUR PUBLIC RIGHT AND O’BLOCK MUST NOT STRIP THIS AWAY FROM US. We do urge and make a public request for Mr. O’ Block to make any corrections to this serious fact, instead of wasting our time with his lawsuit threats. Google: “Angiemedia Stephen Doyne files” where you will see for yourselves at least 14 different boards and the ACFE, all from the same location of a 2508 square foot property, with the same phone number, same owner, Robert O’Block. On the emblem bottom left it reads across the top ribbon, “A LOYAL AND TRUSTWORTHY MEMBER,” and on the bottom ribbon it reads, “SCIENCE • INTEGRITY • JUSTICE.” In the circle it reads, “AMERICAN COLLEGE OF FORENSIC EXAMINERS” – ACFEI. 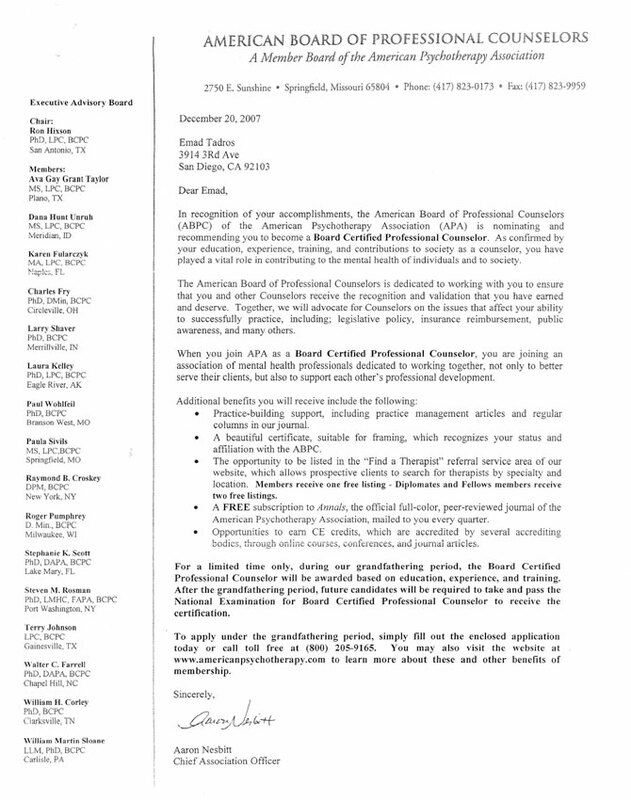 1- December 20, 2007 letter from 2750 East Sunshine-Springfield MO from the American Board of Professional Counselors declares being a subsidiary of the American Psychotherapy Association/APA. It confirms a professionally looking letter to Dear Emad but not to Dr. Tadros with the MD title. This logically conveys that the solicitor had no clue what professional type he was granting this solicitation letter to? 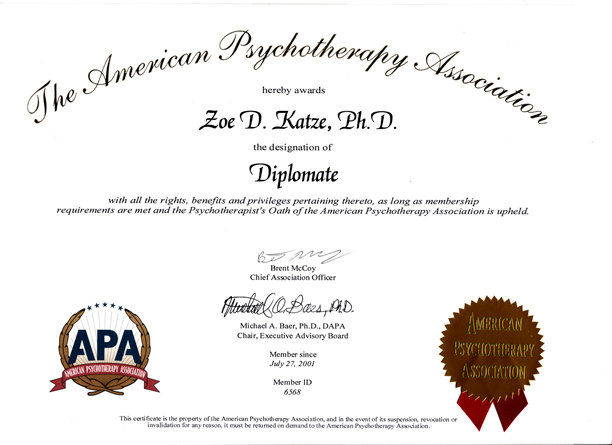 This also gives simple understanding as to how and why “Zoe De Katze” was granted “Diplomate & PHD” from the same address. 2- Offered in this same letter is a grandfathering of Diploma being granted to Tadros and how it would be looking as a Beautiful Certificate, suitable for framing, which is never the professional language of the well respected APA, misleading the average public. This is a needed Public Awareness and Public Trust issue. 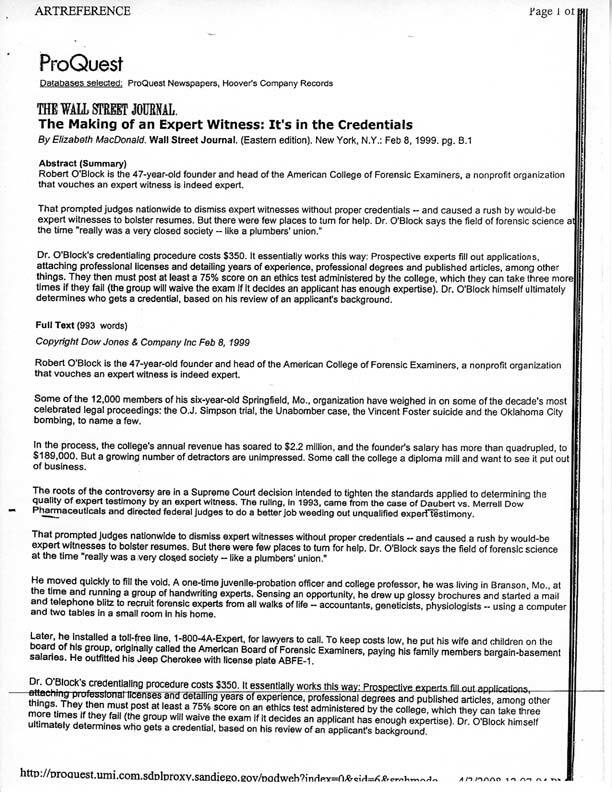 3- On the accompanying first page of the application there is no checking of any credentials. It is only a “Self-Claimed” Point System. 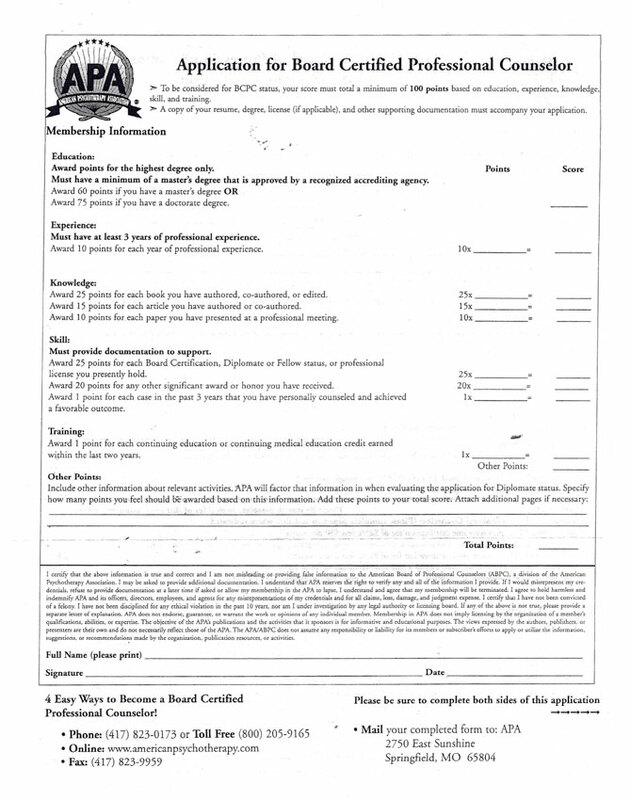 (Again that is how Zoe the cat got Diploma & Ph.D.) On this same first application page, APA offers its selling by declaring a statement to the buyers in the very small bottom box: “..I may be asked to provide additional documentation…” If I would misrepresent my credentials, refuse to provide documentation at a later time if asked. The Solicitor minimizes checking one’s credentials in a barely readable print. Why such a seriously pivotal piece of information is in a very small, barely readable print? This matter is a needed Public Awareness and Serious Public Trust. 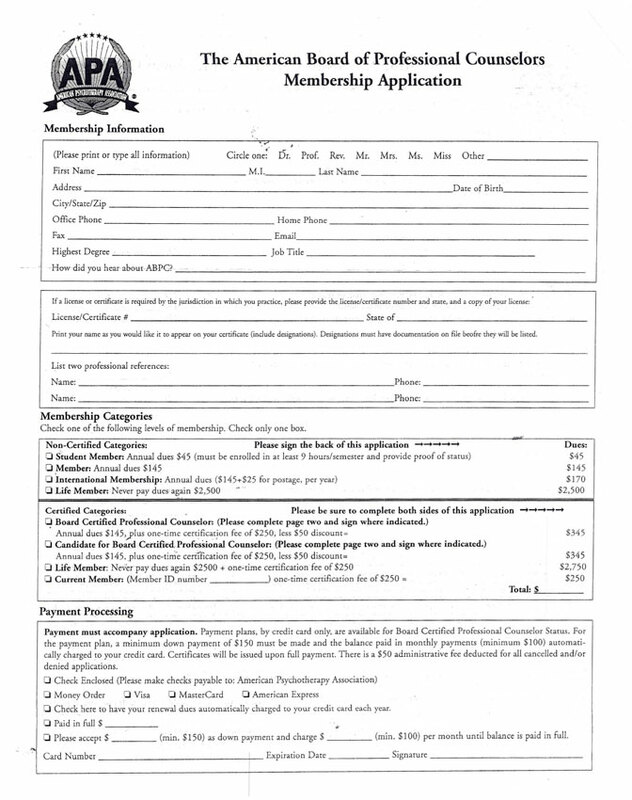 4- The last page of application offers a life time membership for $2500 and special discounts if the buyer purchased more than one item which is never the practice for any well respected organization. The public needs to know how such so called Specialty Diplomate(s) obtain their life time membership for a one time fee of $2500, and how they get grandfathered Diplomate(s) for ~$350. This is especially serious when the owner of the Diploma Mill does not follow common public procedure and instead he refuses to let the public know anything about how those so-called Honored Diplomates obtained their credentials from his entity. 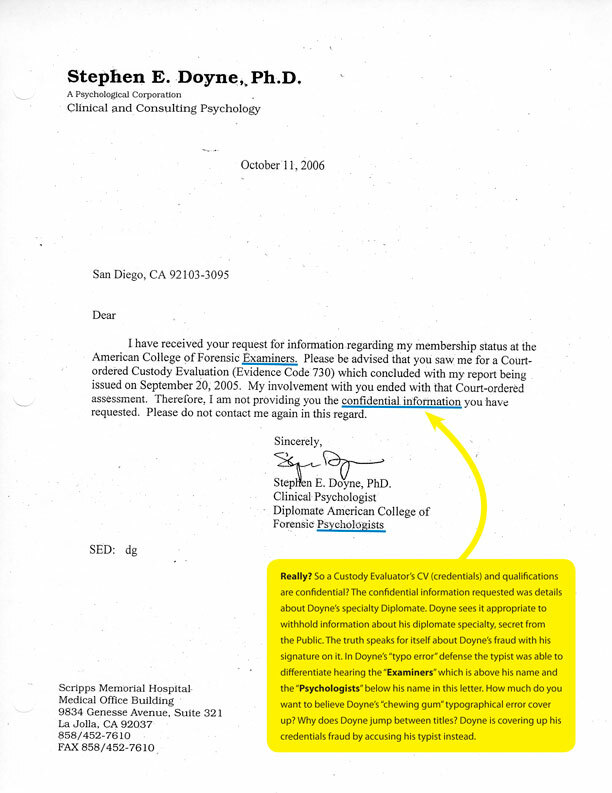 Doyne challenged the Cat Diplomate issued by The Board of Professional Counselors, a subsidiary of American Psychotherapy Association/APA (and counterfeit APA of the well respected American Psychological Association) by replying that Tadros could not prove that Doyne’s Diplomate was being issued from the same location where the cat received hers. 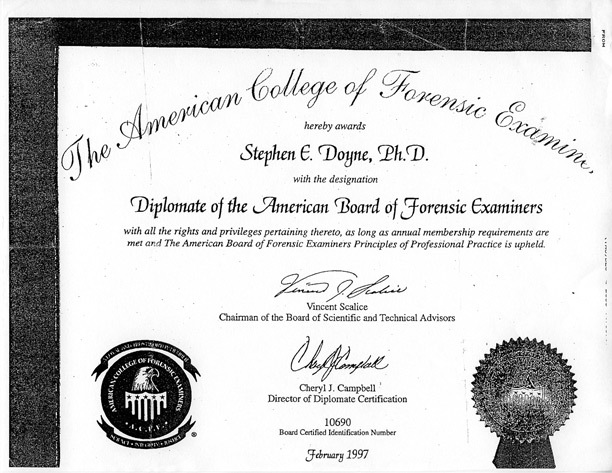 However the address on this letter is the same where the Cat Diploma & PHD came from and is the exact same location for The American College of Forensic Examiners, where Doyne obtained his Forensic Specialty Diplomate Certificate (AA vol.5 p.1329 to 1343), 2750 East Sunshine, Springfield MO 65804.